Set 2 intentions for this year - one for a specific outcome of peace somewhere in the world and another for something you intend for yourself and your life. 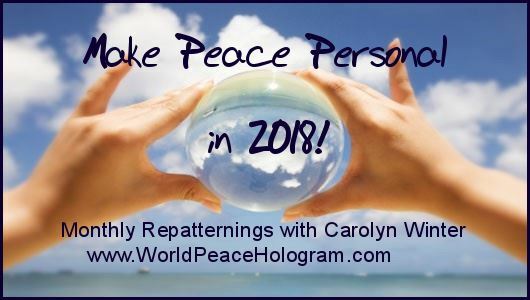 Carolyn Winter includes all intentions for 12 months in a regular repatterning session. Streaming live on Youtube, the events are held on the 1st of each month. The broadcast is recorded and available afterwards. Hosted at our micro website: www.WorldPeaceHologram.com. Submit your intentions at any of the previous session posts and then replay the past session videos. Did the hologram anticipate you? Visit Carolyn's archive link of sessions. At the end of the year we'll survey the group for how peace was created for your intentions.